El retorno de la serpiente. Mathias Goeritz y la invención de la arquitectura emocional [exh. cat.]. Madrid: Museo Nacional Centro de Arte Reina Sofía, 2014, 302 pages (one essay translated by Marta Pino Moreno). ISBN: 978-84-8026-501-0. 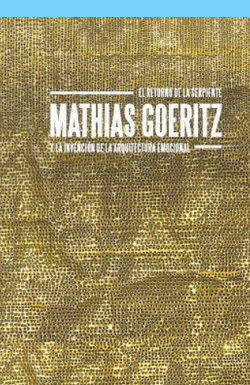 Spanish translation of an essay by Jennifer Josten, for an exhibition catalogue published by the Spanish museum of modern art Museo Nacional Centro de Arte Reina Sofía (MNCARS) on the work of the artist Mathias Goeritz. Spanish translation of an essay by Jennifer Josten, for an exhibition catalogue published by the Spanish museum of modern art Museo Nacional Centro de Arte Reina Sofía (MNCARS) on the work of the artist Mathias Goeritz. Exhibition title: Mathias Goeritz and the invention of emotional architecture. The return of the snake. MNCARS, 12 November 2014  13 April 2015.